Hello, and thanks so much for stopping by! My nickname is Mere and I’ve been blogging about freebies since 1999. Back then I ran my original FreebieJunkie site for about two years, but had to give it up around 2001 because life just got too busy. Fast forward to the recession in 2009, and both my husband and I found ourselves losing our long term careers due to downsizing. We couldn’t find new jobs where we were living, but my husband did find a new job in another state. While we were so relieved that he did find work, the problem was, it was in a remote, rural location where there simply were no jobs for me. I tried to find telecommuting jobs online, but as you know those are very difficult to find. I started to turn to online surveys and crowdsourcing as a way to bring in money, and decided to start blogging again to document my results. Life has gotten busy again for me. I don’t do as much crowdsourcing or surveys now as I did back in 2009, but I do still like to keep blogging about it. The purpose of this site is to show my website visitors just how much money I make each month, and how long it takes me to get there. I hope to show that if one person with a crazy, busy, hectic life can make money in a very small amount of time each day, anyone who wants to pursue online money making opportunities full time can and will succeed. I want to show which sites out there are paying their members, and which sites just aren’t worth their time. If you’re looking to make money at home, either for a few hours each day or full time, I hope the sites I list on this page will help you. Best of luck to you. I know how hard it is to try and find online work. My hope is to make your life a little easier by pointing you in the right direction and helping you avoid scam sites. Still nosy? Want to know more about me? I blog over at MyLot and PersonaPaper too. Are you brand new to making money online, and don’t know where to start? 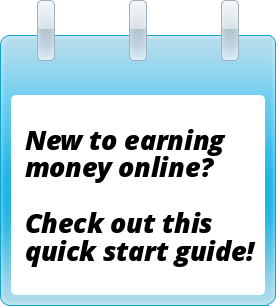 I have a nine-step quick start guide for beginners to help you get comfortable with earning money online. You can check it out here.